Here’s the story of a man who, in his youth, came upon an Ale House during his travels through the countryside. In search of something lost, a man came upon an Ale House in the countryside. The House was rather small, a little dingy, and smelled harshly of booze and strongly seasoned meat. He found himself a seat in a far corner, and ordered a beer and a meal. Out the corner of his eye, he noticed four tiny spiders crawling in a very orderly fashion out from under a rotting, wooden door in the shadows. It was a door that was easily overlooked if you hadn’t known it was there. He was a rough, hard-headed man, so he only nodded the spiders off as being odd. Seeing as everybody in there as odd, anyway. However, an hour later they came back, and they were carrying something folded loosely in cloth. Being as dogmatic and ignorant as he was, he shook it off again and decided to rent a room for the night. He suddenly awoke to a woman’s scream down the hall. Footsteps thudded and shouts clamored, but he stayed in bed where he felt safe. Where he felt, he should be. There wasn’t a reason to get involved. He slept with one eye open that night. He stayed at the House for four nights. Each evening, he sat in that very spot and watched those spiders go to and from the door. They wandered in groups; some in threes, some in fours and fives. They’d wander out, and then they’d come back carrying more little packages. Then one evening, when the spiders were coming back, he readied a piece of meat at the end of the table and flicked it. He whacked one of the spiders right out, and they dropped the package. He got up and ran over, but as the package fell, it slowly unraveled. Inside was a severed finger, with a shiny golden ring! The fear! It crawled through his body and up his skin like insects over honey. He screamed and fell back, and the spiders scattered. His head whirled and his breaths came out short. Trying to get up, he leaned against a table and rooted his feet. What in the Good World? He questioned. Composing himself, he looked back down at the fabric that fell over the finger. He moved in slowly, used just the tip of his foot to flip the fabric off, and oh! The finger wasn’t there. It was only a piece of scrap food. What happened to the finger? He wondered. He knew it was there. He stood there and breathed slowly. His eyes shifted to the shadows. Nothing. There wasn’t anything. After a few moments, he went to his room and laid in bed. Slowly, he drifted off to sleep. A series of banging and thuds woke him again in the night. This time, it came from the next room over. He put his ear to the wall and heard muffled grunts of pain and silent screams of terror. His heart pounded in his chest. Was it the spiders again? He strained to listen, but the struggle had seemed to stop. He rushed out of bed and creeped to the next room. Slowly opening the door, his eyes widened with dread. A man’s body lie in a pool of blood! He had been scalped! Suppressing a scream, he stumbled backward through the door and ran to his room. He turned and locked it and lit all the candles he could find. There was no way! He cried. No possible way spiders could scalp a man! What was happening? He thought. His anxiety crept up and spilt out of him as little fire shadows danced around the room. His eyes shifted and crawled and watched every single one of them as the little black dots got closer and closer. Leaping up, he ran. Through the hall, down the stairs, he ran to the door in the corner of the Ale House. A new fire was lit inside of him. It was a fire of determination. Whatever was behind that door was going to die tonight by his hands. Picking up a metal leverage tool, he pried at the lock. Nothing was going to stop him. He used all his weight until a satisfying crack split the wood, and the door was free. He stopped and breathed. The handle was cold, but he pulled at it slowly then flung it open! Nothing. Nothing. It was a broom cupboard. There were four miscellaneous objects used for cleaning—a broom, a dustpan, a mop, and a bucket. Nothing. His shoulders slouched, and his breath slowed. Honestly, he felt a little disappointed in himself. Shutting the door in displeasure, he turned to head back to his room. But ho! The shadows moved again and in front of him crawled a group of tiny, black spiders carrying a folded cloth. They stopped. He stopped. Then he raged. Lunging forward, he kicked the cloth and stomped on as many spiders as he could. They scattered. Using his foot, he peeked into the cloth. It was not a piece of scrap. It was not. It was unmistakably an ear! His heart raced and his feet faltered. He could feel a tiny tingling on his legs. Looking down, he screamed. Spiders. Spiders everywhere on him. They crawled on his skin, biting, scratching at his skin. They were looking to harvest him. Crawling on his face, they dug at his eye. He screamed and swatted and pleaded, but to no avail. They burrowed underneath his socket and popped his eye right out. As their harvest was complete, they scurried away back underneath the door. He ran out of the Ale House screaming into the woods. I met the man one day, as I was traveling in my youth. He was at that table next to the door in the Ale House. He told me his story, but I thought he was crazy. That night, I rented a room. In the morning, there were murmurs throughout the House about how the old man died in his sleep. The poor old fool, they’d say. Regardless of how foolish he may have seemed, my curiosity got the best of me. 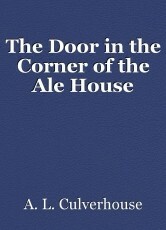 I went up to the door in the corner of the Ale House and pried at the door. The lock eased through the broken wood to reveal a broom cupboard. There was a broom, a dustpan, a mop, and a bucket. In the top left corner, there was a single spider on a simple web slowly weaving its way down to the floor. This House is full of odd people, indeed. © Copyright 2019 A. L. Culverhouse. All rights reserved.